Shellac is an animal product. 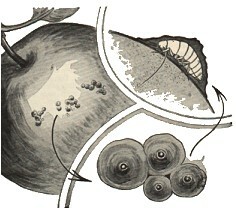 The basic material comes from the Coccus lacca, a scale insect that feeds on certain trees in India and southern Asia. After feeding, the insect produces through its pores a gummy substance which hardens into a protective covering called lac. This lac is collected and then it is crushed, washed and dried. After further treatment, it is skillfully drawn into thin sheets of finished shellac. Many products such as phonograph records, sealing wax, fireworks, and electrical insulators and instruments have shellac in their composition. When mixed with alcohol, shellac forms ordinary varnish. Soon after the scale insect is hatched, it leaves its birthplace and begins to wander about, looking for a likely place to settle down. It finds this place at last upon a stem or a leaf or the outside of a fruit. It inserts its sharp little beak in the tissue and then settles down for a lifetime of sucking at this particular spot. It is soon covered by a substance that it secretes or gives forth from its body - a substance that in certain species looks like wax, in others like cotton, in still others like powder. The growing insect sheds one skin after another; these skins form a rounded little scale, held in place by the secreted substance. A variety of "Radio Shows" that were released as record albums. Currently online are programs featuring Basil Rathbone, Ronald Coleman, Stan Freberg and many others. A sample of the wild and wonderful album covers created for Martin Denny's "Exotica" records. A special Photo-Phono-Pheature from the WAMS Vinyl Annex.